be driven day in, day out. forever be in our heart. difference between triumph and despair. sports car, time and time again. so does a bold vision. The next victory? and rigid patterns of thinking. The dream of the sports car. “In the beginning I looked around and could not find quite the car I dreamed of. for its tight and t wist y mountain roads. cannot be content with the status quo. can develop with a flourish. 718 Cayman. For the sport of it. with standards. And to inspire conviction. name and carry the 718 legend forward. Ever more worthy of its legendary status. and start the web special. one: the resounding thump on the back. the car’s low and central centre of gravity. not necessarily a position of compromise. The principle of the mid-engined sports car. luggage compartment lid and rear hatch. as far as safet y is concerned. 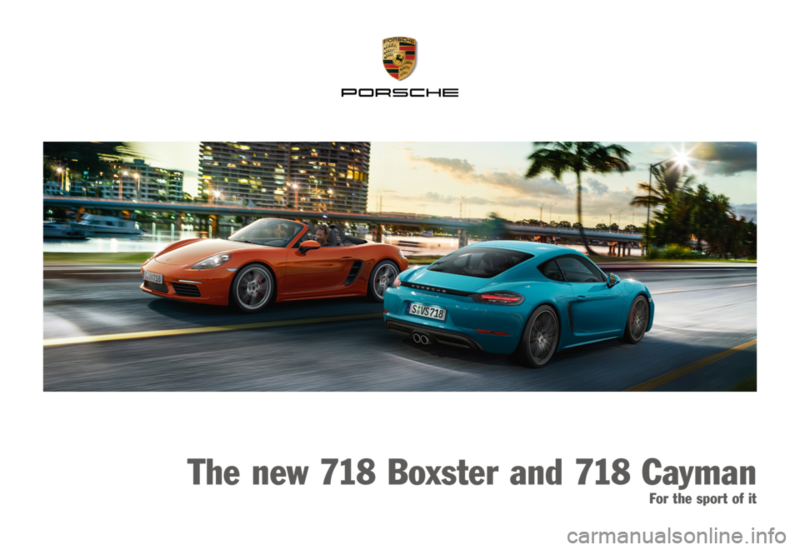 role to play in the new 718 models. The principle of lightweight construction. For fuel consumption, CO2 emissions and efficiency class, please refer to page 141.
do the talking. Sporty actions, of course. always for the sport of it. makes a clear statement: let ’s go!